Towson fell 3-0 to nonconference opponent Virginia Commonwealth Sunday afternoon at Johnny Unitas Stadium on senior day. The Rams (9-4) controlled the pace of the game early. Spencer Tossone beat Tigers’ (1-13) senior goalkeeper Emilee Woodall five minutes into the game to take a 1-0 advantage. At the 12:05 mark, Tossone registered her second goal of the afternoon to give VCU a 2-0 lead. Four minutes after Tossone’s second goal, the team scored again to take a 3-0 lead at the half. In the second half, Towson’s defense kept VCU scoreless. However, TU was unable to find the back of the cage and dropped its fourth straight game. 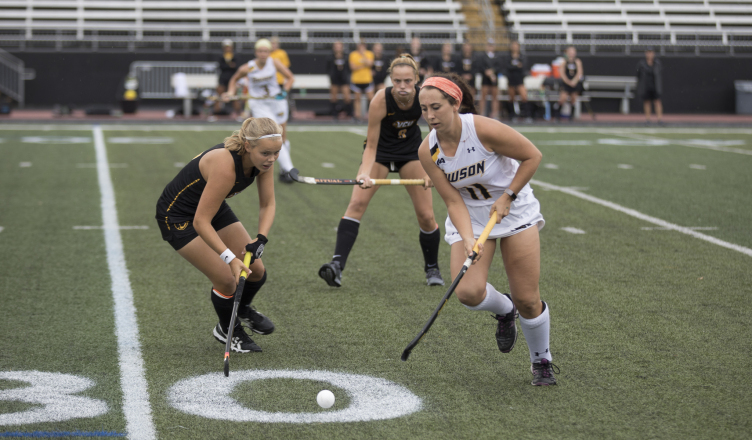 On Friday, Towson fell 3-1 to Colonial Athletic Association (CAA) opponent and the 18th ranked William & Mary Tribe at Johnny Unitas Stadium. The Tribe (9-4, 3-0 CAA) took an early 1-0 lead just 7:34 into the contest on a shot from the top of the circle that was redirected into the back of the cage. William & Mary continued to pressure the Towson defense, registering seven shots and three penalty corners. However, Towson held them to just one goal in the first half. In the 40th minute of the contest, junior midfielder Katie McNeel netted the equalizer with a direct shot off a penalty corner from the top of the circle. Following McNeel’s goal, William & Mary answered nine minutes later with a goal off a rebound after an initial save from Woodall. The Tigers pressured the Tribe’s defense with back-to-back shots, but could not convert on the opportunity. The Tribe added an insurance goal late in the game to ensure a 3-1 victory over the Tigers. Towson heads on the road for its next three games. The team will travel to Philadelphia to face Drexel, Delaware and LaSalle before returning home on Oct.29.